Da kali means “to give a pledge” in Bamana, the most widely spoken language in Mali. The phrase refers to the deepest responsibilities of a griot (or jeli), a commitment to preserving the memory of history, but also adherence to a rigorous ethical and moral code. For this trio—consisting of Fodé Lassana Diabaté on balafon, Mamadou Kouyaté on bass ngoni and Hawa Kassé Mady Diabaté on vocal—da kali expresses a mission to preserve and honor the very essence of that tradition, currently under siege on many fronts. The praise aspect of griotism (jeliya) has been steadily undermined by a high-pressure economy in which griots are no longer attached to individual families, but rather forced to work the wedding/baptism circuit offering flattery and kind words to all assembled, with varying levels of reference to this region’s richly complex history. Today, even that source of income is being eroded by a rising wave of Islamic singers known as zigiri, whose points of reference lie in the Middle East where Islam was born, not in the proud days of Mali’s great empires. In a changing Mali, elite families increasingly opt for the status and safety of religious entertainment rather than music that reflects their own history and culture. This is not to say that Trio da Kali is in any way staid or conservative. On their own, they present spare musical perfection. The trio mostly avoids the oft-repeated warhorse songs of the griot repertoire, digging deep to reveal lesser-known treasures. Lassana Diabaté is simply one of the most thrilling instrumentalists in Malian music, his soaring, melodious solos a marvel to behold every time. Hawa Diabaté, daughter of the iconic griot vocalist Kasse Mady Diabaté, has inherited her father’s spectacular vocal skills, as well as his meticulous artistry and charisma. And Mamadou Kouyaté, son of ngoni superstar Bassekou Kouyaté, lays down bass lines that pump and groove with the force of an entire rhythm section. The trio’s ungarnished, all acoustic sound actually seems radical in this era of every more elaborately produced West African music. And from the start, they have expressed an interest in collaboration and innovation. Lucy Durán, pioneering scholar of Mande music and a legendary producer of landmark albums, especially from Mali, has nurtured the trio since its inception. The project has been supported from the start by the Aga Khan Music Initiative, a program of the Aga Khan Trust for Culture. 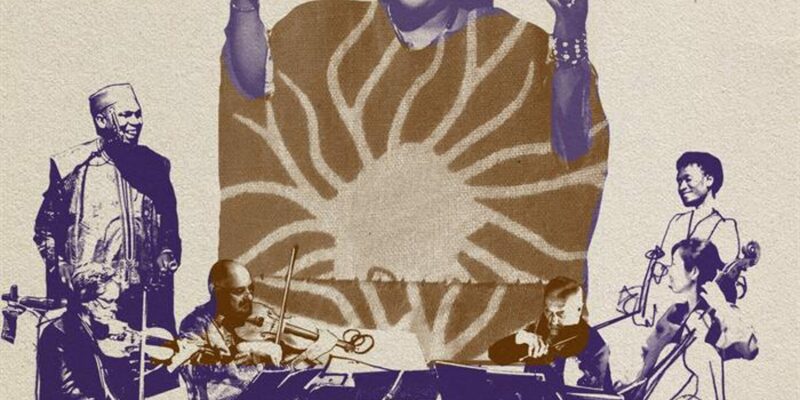 Durán and AKMI soon found collaborators worthy of Trio da Kali’s musicianship and vision: Kronos Quartet. The two ensembles first met some years back. They performed together memorably in Berkeley, Maryland and Montreux, and then took time to refine their ideas. By the time they gathered in Switzerland to record these 10 tracks in just four days, the musicians all knew exactly where they needed to go together. And their easy rapport and seamless merge of traditions and sensibilities is palpable throughout. The players of Kronos are no strangers to challenging collaborations, nor to African music. Their 1992 release Pieces of Africa ushered them into a wide-ranging world of African music. A quarter century later, this venture is more focused and satisfying, truly a meeting of masters. The opening track, “Tita,” starts with balafon and bass ngoni sketching out the essence of a griot classic, which asserts young peoples’ rights to follow their hearts in love and marriage, rather than the social schemes of their ambitious parents. Hawa sings with poised majesty, her deep clear voice building gradually as Kronos insinuates a presence with restrained chordal backing. As in many of these arrangements, the quartet emerges powerfully at times, much as a solo guitarist might in a modern performance of griot music, then drops to almost nothing as Hawa recapitulates her vocal. There’s a lively exchange between racing balafon and chugging string section stabs near the end of “Tita.” It is as if the Kronos was a single player entering into the hospitable milieu of Mande music as gracefully as any kora or ngoni of old. “Kanimba” opens with Hawa’s vocal, harmonized by the quartet, now taking the role of backing singers. The piece opens into an ambling balafon groove, as Hawa celebrates the teasing relationships between siblings that define an integral part of Malian social dynamics. Lassana’s fleet, light-footed balafon solo races along with the quartet and bass churning moodily in the background. The arrangements here are nicely varied, allowing either voice, balafon, ngoni or quartet to establish the song’s terrain before introducing other elements. On “Garaba Mama,” a pentatonic piece from Segou, Kronos churns up up a brooding bluster of string sound into which Lassana’s balafon ambles in with a tripping vamp, all setting the stage for Hawa's lustrous voice. All the sounds in this ensemble are strong and forthright, from Hawa’s serenely confident vocals to Kronos’s ever-surprising interventions, a rich wall of harmony on “Lila Bambo,” whipping, crying violin strikes on “Eh Ya Ye.” Nothing is ever wasted or extra. Perhaps most gratifying here are two tracks that nod to American gospel diva Mahalia Jackson. Kronos’s David Harrington noted a similarity in the robust sonority of Hawa’s and Jackson's vocal timbres. “She even looks like Mahalia,” Harrington quipped upon meeting her. This album’s rendition of Jackson’s “God Shall Wipe All Tears Away,” rendered in Bambara, will send chills down your spine. The ease with which Hawa enters the aesthetic realm of gospel—a genre of music she had not previously heard—is uncanny, and a testament to her outsize musicality. Even better is “Ladilikan (Words of Advice),” a composition based on Jackson’s “I’m Going to Live the Life I Sing About in My Songs.” Slow and funky, and graced with the album’s catchiest vocal hook, this track is a masterpiece. Hawa verges on blues belting and when Kronos surges forward in the wake of a high-flying balafon solo, the effect is somewhere between a gutbucket gospel rock rhythm section and a Middle Eastern orchestra on a dark tear. Jackson’s song calls out Christian hypocrites who “go to church on a Sunday and then misbehave on a Monday.” The Malian version turns a critical eye on jihadists in the north of Mali, daring them to attempt the banning of music. Durán's informative notes provide deep context for the songs, completing what must now stand as the most successful encounter between Western classical and traditional African music yet.